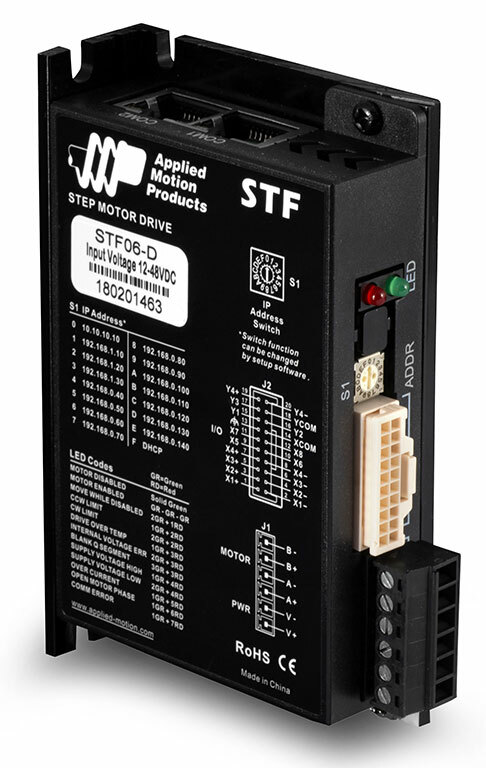 The STF06 stepper drive is a DC-powered microstepping drive for controlling two-phase, bipolar step motors. It offers advanced current control and an anti-resonance algorithm that electronically damps motor and system resonances to improve motor smoothness and usable torque over a wide speed range. The drive employs electronic torque ripple smoothing and microstep emulation to greatly reduce motor noise and vibration. The drive must be powered from 12 to 48 VDC and can output up to 6.0 A/phase (peak-of-sine) to the step motor. Over-voltage, over-temperature and over-current protection features prevent damage while running in adverse conditions. The STF06 sits in the middle of the STF series in terms of power. It is complemented by a specifically matched set of stepper motors (see Related and Recommended products below). For a higher-powered STF drive see the STF10, and for a lower-powered drive see the STF03. 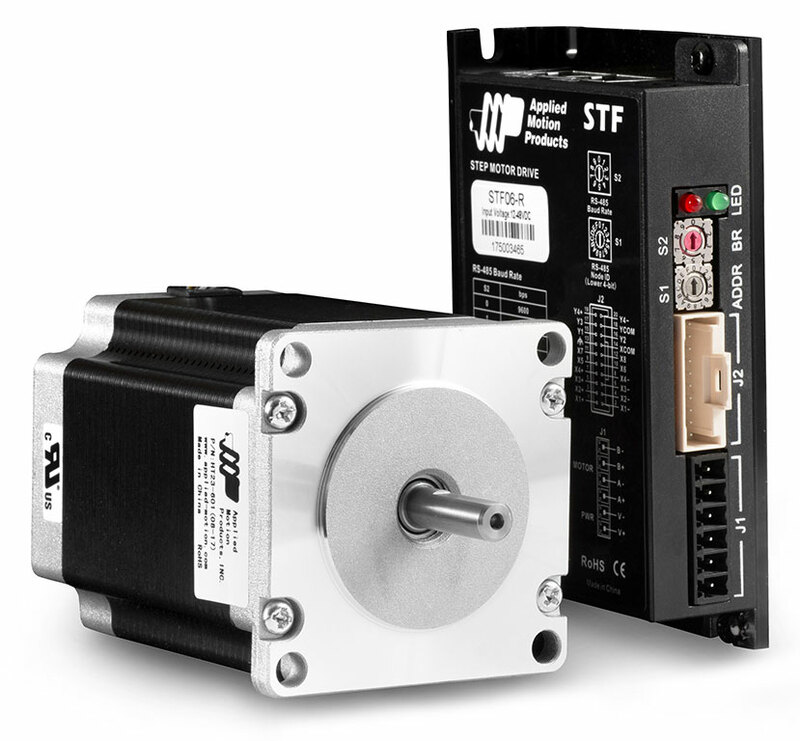 For stepper drives with encoder feedback options see the ST Series Stepper Drives. For connecting to external devices such as control signals, limit switches, proximity or photoelectric sensors, PLC I/O, lamps, and other devices, the drive comes with 8 digital inputs and 4 digital outputs. The function of each I/O point is configured with the STF Configurator software. Details on wiring different I/O types can be found in the STF Hardware Manual (see Downloads section). Note: Flying lead I/O cable is sold separately, P/N 3004-348 . There are five different communication options to choose from, as shown in the table below. All STF03 drives offer stored program execution using Applied Motion's Q Programming language. Dual RS-485 ports for configuration, programming, and networking connections. Stream commands from a host controller to as many as 32 axes using Applied Motion's Serial Command Language (SCL). Built-in support for Modbus RTU communciations. Dual CANbus ports for operation as a slave node on CANopen networks. Conforms to Can in Automation (CiA) DS301 and DS402 specifications. Supports Profile Position, Profile Velocity and Homing modes, as well as the ability to run stored Q programs via Applied Motion-specific CANopen objects. Dual fast 10/100 Mbit Ethernet ports for configuration, programming and networking connections. Stream commands from a host controller to multiple axes using Applied Motion's Serial Command Language (SCL) over Ethernet. Supports both TCP and UDP protocols. Built-in support for Modbus TCP communications. Designed for use on EtherNet/IP networks, the widely used industrial protocol for manufacturing automation applications. With EtherNet/IP, users can control, configure and query the drive using an open, standards-based, industrial Ethernet connection at speeds up to 100 Mbits/sec. Specifically designed to operate on EtherCAT networks using the CANopen over EtherCAT (CoE) protocol. Conforms to CiA DS402 specifications. Supports Cyclic Synchronous Position(CSP), Profile Position, Profile Velocity and a range of Homing modes. Able to run stored Q programs, which can be controlled over the EtherCAT network via Applied Motion-specific objects. All STF drives are CE approved and RoHS compliant.